Analytics and Data Science have seen steady growth in the past few years, and they’re all set to be the jobs of the future. These domains are helping companies leverage data to make smarter decisions and drive better results. With the increased proliferation of digitisation replacing paper-based processes, businesses and organisations now have access to large amounts of data on their processes and resources. The advantage of this digitisation is two-fold – one being that it’s made data collection and preservation much easier. This has, in turn, granted access to large volumes of data that were previously unavailable for analysis. The next step after getting access to all this data is to analyse them and mine them for insights. The world is on a steady trajectory towards relying on hard-data to make rational decisions, instead of relying on untested hypotheses and ‘gut feelings’. The demand for higher degrees of efficiency in processes can only be achieved through insightful analysis of clean data, which is facilitated by Data Science and Analytics. The need for qualified analysts who can make sense of large volumes of data has created a large demand of analysts and data scientists who can work across industries. This has created huge opportunities for professionals who are able to leverage the data to offer new insights. There are a wealth of opportunities available in India, waiting for the right talent to snap them up. 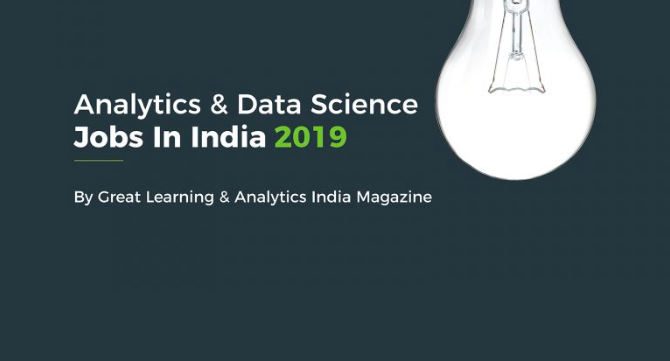 To make it easier for modern professionals in India to understand the kind of opportunities that are available to them, we partnered with Analytics India Magazine to produce the Analytics and Data Science Jobs in India Study 2019.